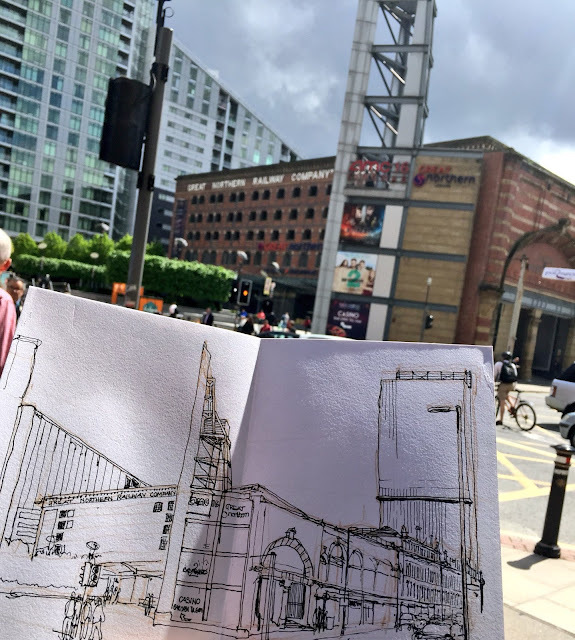 [By Liz Ackerley] We are now on the 8th week which means that we only have 9 more weeks until the USk International Symposium here in Manchester! For this sketch, we are still on Deansgate with the very large and imposing Great Northern Railway Warehouse centre stage. This is the former railway goods warehouse of the Great Northern Railway and is now a leisure and shopping complex, refurbished in 1999. 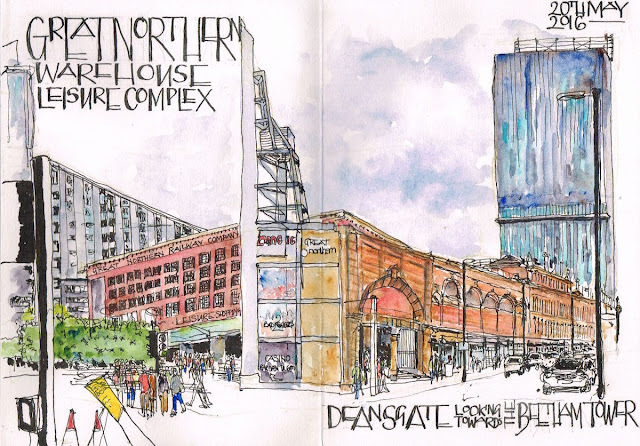 The building is at the junction of Deansgate and Peter Street (which runs up to the Central Library). It was built above the Manchester and Salford Junction Canal and a dock beneath was constructed to allow goods to be transferred to and from canal barges, via shafts. It is a unique survival of a 3-way railway goods exchange station, serving rail, canal and road networks of the Manchester region. In this sketch you also see the Beetham Tower (also known as the Hilton Tower) playing a somewhat dominating role. I promised myself only 1 sketch where this is the case! Where it appears on others, I shall have it much less dominant! Its a 47 storey fixed-use skyscraper completed in 2006 and was designed by SimpsonHaugh and Partners, architects based in Manchester. At a height of 169 meters it is the tallest building in Manchester and on opening was the tallest residential building in the UK and second tallest in Europe. The structure is one of the thinnest skyscrapers in the world with a height to width ratio of 12:1 on the East-West facade (not the one you see here). Architectural response varies. Some question its dominant appearance over the city, particularly over listed buildings whilst others feel its dramatic appearance and peculiarity is reflective of Manchester and that the Beetham Tower symbolised Manchester's reinvention as a post-industrial city. It was awarded the best tall building in the world in 2007 by the Council for Tall Buildings and Urban Habitat!